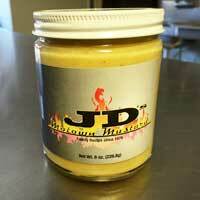 JD’s Motown Mustard is all natural with only 5 ingredients in the 8 oz glass jar. The flavor profile is sweet with a zip that doesn’t burn. Each batch of this sweet and spicy mustard is made by hand with care, using an old family recipe dating back to the late 1800’s. JD’s Motown Mustard is produced with all natural ingredients made right here in Michigan. Allergy Alert: Contains egg. Spice up meals with JD’s Motown Sweet & Hot Mustard – use in potato salad, on brats, hamburgers and hot dogs, as a pretzel dip, or as a glaze for grilling chicken, pork and fish – the possibilities are endless!